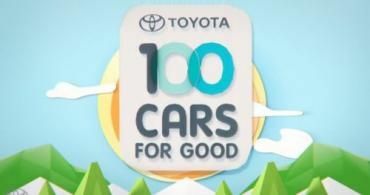 Toyota is asking the public to pick a charity a day for the next 100 days to receive a free vehicle as part of their annual 100 Cars for Good event. You can vote for your charity picks starting right now. The second year of Toyota's program, 100 Cars for Good began today as 500 charities will try to win one of 100 cars the auto manufacturer is giving away. Voting is entirely up to the public and being done on Facebook. So if you have a Facebook account and want to participate, your vote matters. You can visit 100 Cars for Good, choose from one of five charities listed daily for the next one hundred days, and help Toyota give away one hundred cars to needy organizations around the country. At the end of each day, the organization with the most votes of the five charities listed will win their choice of a Camry Hybrid sedan, Highlander SUV, Prius v hybrid hatchback, Sienna minivan, Sienna Mobility minivan, or Tundra pickup truck. The 500 finalists in Toyota's charity lineup this year come from all fifty states and Washington, D.C. and their profiles can be viewed on 100carsforgood.com. Those non-profits that do not win a car will win $1,000 in cash and all finalists have received digital cameras, training materials, and online advertising credits to help them get the word out about their charity on the Internet. Vote for "Canine Partners For Life" (CPL) for the Toyota 100 Cars for Good Program. "CPL" is a non-profit organization that provides "Service Dogs" to handicapped individuals. The only day to vote for "CPL" is "June 26th", so please logon and vote for CPL on "June 26th". We need your help. Thanks.